Bruce Boisclair has for some time represented to me the road not taken. He broke into the majors in September 1974, when I was six years old. I had not yet seized on baseball as my primary life raft, but more significantly my family had just moved to Vermont from the possible Mets fan territory of Hopewell, New Jersey. I have always assumed that if we had stayed in New Jersey I would have grown up a Mets fan rather than a Red Sox fan. I have put considerable thought into this alternate path. Mainly, I have come to believe that if I had grown up in New Jersey, I would have been chronically beaten by bullies. In Vermont, I was twice menaced by this one kid with putrid breath, Mark, but on both occasions (once in a bathroom at school, once after school when he grabbed my baseball glove away from me) my instinctual defense mechanism—bursting into abject, uncontrollable weeping—managed to disgust and confuse him enough to prevent him from inflicting upon me any bodily harm. Both times he ended up just walking away from me with a look on his face like I was a pile of uncommonly pungent cow manure. I always assumed that New Jersey, more heavily populated in general, would have had a higher density of merciless future violent criminals roaming the sidewalks for victims. I would have been dangled from turnpike overpasses in broad daylight, beaten beneath a pollution-covered moon, and marked by pen knife scars, pellet gun wounds, and various teeth-chipping incidents. Eventually I’d have etched into my features an uneasy, pinched look similar to the one shown here by Bruce Boisclair on the cusp of his final major league season. By the time I would have purchased this card on one of my danger-fraught New Jersey trips to the corner store, I would have seized on Bruce Boisclair as a hero. In the safety of my room I would have exulted at the discovery of this card in my new pack, for Bruce Boisclair by then would have become for me a conduit to a different reality. Through him I could have imagined another life. I would not have seen myself in the major leagues but would have dissolved myself out of existence altogether to become Bruce Boisclair. There were other, better players on the profoundly lackluster Mets at that time, but even though none of them were really that great, their abilities still were such that they would have seemed beyond the reach of my self-abnegating imaginings. I couldn’t dissolve into the dashing Lee Mazzili, for I wasn’t dashing, and I couldn’t dissolve into the fleet and promising Steve Henderson, for I wasn’t fleet or promising. But Bruce Boisclair would have been a different story for my timid, hunted New Jersey self. I mean, just look at him. He seems to be bracing for a roundhouse left to the ear. Worse, he’s up at bat with a hitting implement that will nullify, by virtue of its illegality, any positive result he might somehow be able to produce. An aluminum bat! Why on earth would there even be an aluminum bat on the Mets’ spring training complex? Perhaps Bruce Boisclair snuck it onto the grounds himself and was considering the possibility of using it (maybe painted to look like a wooden bat) in the upcoming season. As it turned out, he seems to have had to use the same kind of bat as everyone else, with which he hit .184, and he was released the following spring. By 1980, in other words, I would have been on my own, Boisclairless, to face the troublesome world. 1. He looks like a young Pete Carroll to me. Maybe, like Carroll, Boisclair was a success in college after failing in the pros. In college, they’d let him use his beloved aluminum bat, but he’d have to use an assumed name. New Jersey Fan #1: You ever see him play? New Jersey Fan #2: Yeah, I saw pictures. Ed Kranepool: I saw Bruce Boisclair play. New Jersey Fan #1: Yeah? What do you think? Ed Kranepool: He was the best. Run, hit, throw… he was the best. New Jersey Fan #1: So what do you think? Is it him? Ed Kranepool: Nah. Those fellas are all gone now. 2. Too bad the photo doesn’t illustrate Bruce’s distinctive batting stance: He was tall and very lanky, and those legs were spread W-I-D-E part and crouched, so that the uni fit super-tight. Bruce wasn’t much of an outfielder but once made a long run to catch a fly ball in foul territory near the seats, only to see the winning run trot in from 3rd base. 3. Can you tell us how you just know that you would have been a Mets fan rather than a Yankee fan had you grown up in New Jersey? Naturally, since you actually became a Red Sox fan that possibility would be currently unfathomable. But since you wouldn’t actually be a Red Sox fan, surely it might have been fathomable? Or is there some geographic or other impediment to, or unlikeliness of, New Jersey residents – or certain subsections of New Jersey, perhaps – being Yankee supporters? This is a great blog. I’m vey happy to have been pointed here, and wish you the best in getting it published as a book at some point. 4. 1: Beautiful 8 Men Out Spoof, especially in the casting of the Buck Weaver role. 2: When I get a second, I’m going to look for that Ultramets.com story. I just wish the quote could have been “He didn’t hassle nobody” instead of “He didn’t hassle anybody.” Ah, what the hell, I’m making that revision in my mind anyway. 3: Great (and extremely troubling) question, Berkowit28. I have thought of that myself many times but have been afraid to really address the possibility that I could have grown up a Yankee fan. I refuse to believe it could have happened. The main reason I figure I would have been a Met fan is that after the move to Vermont my brother and I visited my dad in New York City and he took us to Met games (he wasn’t a baseball fan but we browbeat him into taking us). This has nothing to do with New Jersey, really, but it did give the late ’70s Mets a place in my heart that made it easy to imagine me being a fan of them had we stayed in their vicinity. The truth of the matter is, actually, that if we had stayed in Jersey, we probably would have been Phillie fans. I never entertained that possibility until this morning, when I mapquested the distance between Hopewell and NYC and then between Hopewell and Philly. Philly’s considerably closer, plus we had cousins in south Jersey that were already Philly fans. I wonder who my Boisclair would have been then. Del Unser? Barry Foote? 5. Why is he clutching an aluminum bat in this photo? Was there a special Bruce Boisclair rule to even the playing field? Either that, or abducted from an upstairs window by Bruno Hauptmann. Knowing nothing of Hopewell, New Jersey, other than that incident, that’s the first thing that came to mind. 7. That bat really is chumpy-looking. The Topps photographer shoulda completed the look by having him hit off a tee. 8. Not everyone in Vermont who follows baseball roots for the Sox. 105.3 out of Killington carries Suzyn and Sterling. As for Bruce, musta missed him. Nice call on the bat. 9. 8: True, true. There were some Yankee fans in my town, and I always had the feeling it was even more that way down by Rutland and Killington. Oddly, in all my years in Central Vermont and also while going to college in Johnson, Vermont (farther north), I never met an Expos fan. The most famous baseball guy to come out of my Vermont town, Buster Olney, was a strident, impassioned Los Angeles Dodger fan. 10. I never knew that Olney was a Dodger fan. My neighborhood in north central Connecticut seemed to be evenly divided between Sox and Yankee fans. I don’t think that the Mets broadcast on TV in that market until the 80’s. 660 reaches the are loud and clear, but the Mets weren’t on that freq until 1988. 11. Sometimes those aluminum bats are just heavily weighted warmup bats. We had one in high school that had “The Log” printed on the barrel, but it was not made of wood. One of our pitchers used the bat during an intersquad game and got a hit. It was quite hilarious at the time. 12. 11 That’s gotta be the explanation for that bat. Thanks, Icaros. Your story of the pitcher getting a hit with “The Log” reminded me of the time the cleanup hitter for my lousy Babe Ruth league team went up to the plate with a fungo bat. 13. I used to fantasize about using the fungo bat myself. I was pretty small and scrawny, so I had a hard time generating much bat speed. The fungo bats felt a lot like wiffle-bats, and I was an awesome wiffle-ball hitter. 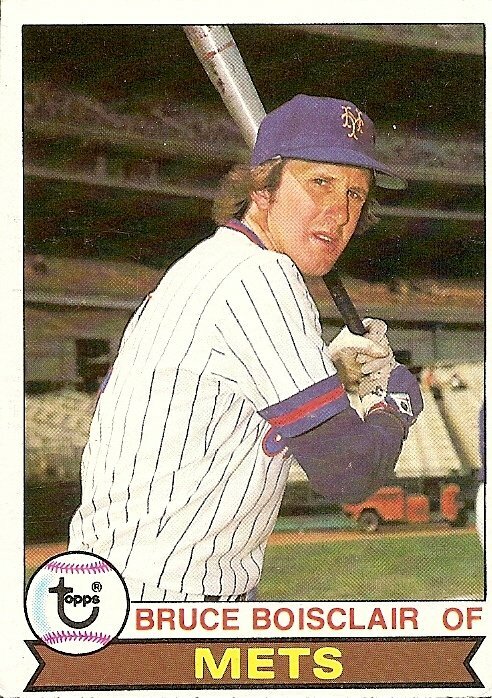 Bruce Boisclair was another in a long line of thoroughly mediocre Mets outfielders in the mid-seventies thru early eighties, such as Jim Beauchamp, Jim Gosger, George Theodore, Dan Hahn, and Dave Schneck. If you were a Phillies fan, Del Unser couldnt have been your hero. He was the clutch playoff and World Series hero for the Phillies in 1980. Barry Foote maybe, but he wasnt on the team very long. But you would have loved Danny Ozark.